Mohu isn't a typical antenna company – in addition to making traditional OTA antennas, the company has tried its hand at products as diverse as streaming boxes and smart boom boxes. To founder and CEO Mark Buff, that just makes sense: in a market that is constantly changing, only a company that is willing to try everything can succeed. Mark was kind enough to speak with me over the phone and share his thoughts on his company, the industry, and the future of OTA and OTT – which he sees as linked. 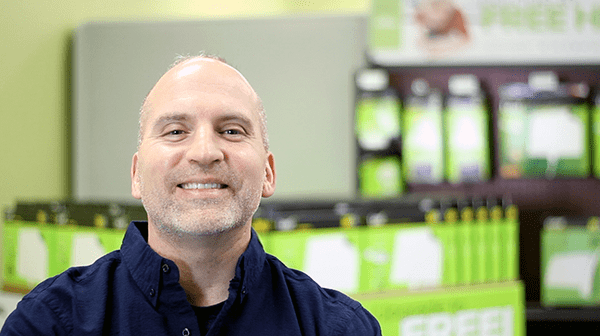 Among other things, Mark spoke with us about the merging of OTA and OTT under a single device – an idea that Mohu and other companies are exploring right now, though Mark was cagey about what competitors, if any, might lurk in that business space. He also explained his company's innovative culture, which he sees as rooted in its venture capital-free business model, and discussed the decline of pay TV. Check out the full text of our interview below! Other than a few minor edits for clarity, the following interview is complete and unedited. Cordcutting.com: Could you describe a typical day as CEO of Mohu? Is there such a thing as a typical day? Mark Buff: You know, it really does vary. We have a lot of research and product development going on right now, and a lot of interesting partnerships that we're trying to cultivate. [But] there really is no typical day – which is an advantage. It keeps everything fresh. I know you have a PhD in engineering – do you still use that on a day-to-day basis? Yes, I have a PhD in electrical engineering with a focus on electromagnetics, and that's quite helpful in an antenna company and a product development company… so at least when I have a department of engineers I know exactly how to really dive in and find out what the challenges are, and what the risks are. However, during the course of that PhD, I took a year's worth of MBA coursework. So I would say, obviously, that the majority of my life is spent thinking about business topics and challenges. But the PhD certainly comes in handy as it pertains to running an innovative R&D group. What are your current concerns – are there any issues or things you're trying to focus on? Well, new product development is always a challenge. You never know what products are going to take off and which ones aren't. And consumer needs, you never really know how those are going to work out. As far as what I worry about, I would say it's probably the industry. We know that people are cutting the cord, and we can see that in our numbers – our numbers show pretty strong growth year to year. However, the landscape's changing quickly. Every day that goes by, you hear news of a new OTT service, a new streaming service. So just trying to keep your eye on the ball – how the industry's changing, how the landscape's changing – and trying to stay ahead of that, I'd say, is probably the biggest challenge. I know Mohu does a lot more than just antennas. In light of that, who do you consider your competitors? Do you have any direct competitors? Are there any companies that you consider competitors that might surprise us? You know, I don't really compare us to other antenna companies because I think more of our competitors are focused directly on antennas. And I feel pretty comfortable in that space – I feel comfortable with our penetration and our distribution. [But] we are venturing out and diversifying into other areas, and what we're trying to do is innovate where we don't have direct competitors, so our new products will be different. However, it's really more of a concern of “how well would the product do?” as opposed to one of direct competition. What do you consider to be Mohu's primary competitive advantage? We have a very strong development team and we have a very strong marketing team. And I would say that the way that we market [is an advantage] – we are very big inbound marketers. We believe in very strong content, relevant content. On the innovation side, we have some extremely high-end talent that I'm very proud to have. And from that perspective, I think all we need to do is create value in a product – keep the product simple, keep the user experience where it needs to be – and everything else should fall into place. Speaking of products, what are your thoughts on the ATSC 3.0 standard? I know that LG and Samsung were able to show something at CES – are you guys working on any thing similar? We are not working on anything related to ATSC 3.0. We are keeping our eye on that ball, but at the moment we're not working on anything related to 3.0 because we're not real sure when that will actually hit the airwaves. That was actually my next question – do you have any thoughts on when 4K over the air will be available to consumers? I know it took about five years to ATSC 2.0 to hit the airwaves, from when it was first conceived to the actual launch, so that's a variable that we just don't have the answer to. So would it be fair to say that working on something like that would be premature at this point? I'm not sure it would be premature, but we are in fact-finding mode right now to find out if we can get a better handle on when something like that will become a reality. Continuing on the subject of new products, I know you have a product called the BeBox, which is a smart boom box. That's a little surprising considering that you're an antenna company – what made you guys decide to go in that direction? There are a lot of us here that are audio fans, audiophiles – as a matter of fact, our VP of Marketing is a music major. And because we're not venture capital-backed, we pretty much just like building products that we would like to have. The BeBox is a fantastic product. It was just a hole in the marketplace that we identified, we felt like it was a product that would fill a need, and it's doing well. So we're very pleased with BeBox and it will likely lead to an entire audio line for us. You mention that you're not venture capital-backed – what does that mean for you? You know, it just gives us a lot of freedom. Basically, I'm the owner of the company, so there's not a private equity group or anything like that that funds the company. Typically, when you have a private equity group, they dictate the direction or strategy, or at least have a big hand in it. And, essentially, we don't have that, so we have a lot of freedom in choosing the direction that we want to take in product development. Speaking of your products, I know you had a Kickstarter success with Mohu channels, but that product has since been discontinued. What happened there, and did you learn anything from that? We did. Obviously, with the Roku and Apple TV penetration, that's a very tough space to get into. We did learn a lot, we got a lot of feedback, we got a lot of take-up, and it's helped shape our thoughts on our next round of product innovations. Whether it's Mohu or another company, do you expect OTA and OTT to merge under a single device sometime in the future? If so, is that device that Mohu is going to try to create? Cord cutting, by definition, really is over the air and over the top, so we do see that people are combining on their own. It's not in the most elegant way – where you have to change the inputs and all of that – so I do believe that a company will figure that out. I know that we're working on some items to make it easier for the cord cutter and to bring all of that content together. Mohu Channels was a first attempt, and now we're working on some other products that will take a slightly different approach. So, yeah, I believe that that's what the cord cutter is looking for – not only the easy of installation, and that paradigm shift of moving from a paid TV to a cord cutter mindset, but also being able to bring all of that content together in a seamless fashion. I absolutely think that companies are working on that, and I know that's something that we're actively working on. Do you know of any specific companies working on this problem? Do you expect a lot of competition in this space? I know that there are ways that you can bring content into a set-top box – not really the networks yet, so I'm not really clear on how that's all going to work out – but suffice it to say that we're working on something that will make it easy for the user to bring all the content together. How do you view the relationship between OTA and OTT? Are they in conflict? No, I think OTT and OTA is a great partnership in terms of content and [have] the same audience base. I do know that the OTT folks have a harder time advertising and promoting cutting the cord because of relationships they have with content providers. We're not bound by those same restrictions, and a lot of times we will form partnerships based upon that directly. Because we are big proponents of getting rid of pay TV, and we do not have those restrictions. From a consumers perspective, they absolutely go hand in hand. And as far as the OTT folks – they may, based on their content agreements, they have some restrictions on what they can say and what they can't say. Is your perspective on OTT any different when you look at, say, Netflix (where everything is on-demand) versus when you look at Sling TV or Amazon Prime's proposed live TV bundle? I don't necessarily see Netflix as being a competitor as much as I see the Amazon Prime live package as being a competitor. Ultimately I think, in the end, the customer is tired of paying the monthly fees, so I think they'll realize that what's available over the air in high definition for free with an antenna, I think ultimately is always going to win. But, like I said, I think bringing all of that content together in a seamless fashion is really what the consumer is looking for – without the monthly bill. What's next for your company – new products? New product categories? What's next for us is really just catering to our loyal consumers. We have a very loyal base, and we get a lot of great feedback from that base. And the feedback that we get is: “how can we bring OTT and OTA and all of the content together in a seamless fashion?” That's really what we're focusing on right now, along with some other products that are probably a little too early to talk about. But it's really to become the center of the cord cutter's universe, the OTA-centric cord cutter's universe. What do you think the entertainment landscape – by which I mean all of it, streaming, cable, OTA – will look like in five years? That's a great question. I wish I knew. It changes so fast, and there are so many companies coming out with different types of products and different variations of content, that I don't really know. But what I can say is that I do believe that free over the air is not going anywhere. I believe that there is a lot of opportunity for growth and expansion in ATSC 3.0 – as far as, not only the 4K, but the targeted advertising. So I believe that ATSC 3.0 will play a big role in that. Streaming is not going anywhere, and pay television, I think, is probably starting to realize that the tides are starting to turn.